>> I am a new customer. How do I set up an online account? To set up a new online account, you may click on Account Login, then follow the link to “New Account Registration”. >> I am a returning online customer. How do I log in to my account? Please click on Account Login and enter your email address and password. If you have forgotten your password, you may click on Forgot your password? >> I forgot my login information. How do I recover it? Click on Forgot your password? on the Account Login page. You may then enter your email address to have your password delivered to you. If you need to know what email address you used for your account, please contact us. >> I received an email confirmation that I have been added to the wholesale group. What now? Please click on Account Login and enter your email address and password. Contact us if you have any questions. >> I am a medical practitioner or from a health food store or pharmacy. Can I purchase BioResponse products wholesale? If you are a Medical Practitioner, Health Food Store, Pharmacy, or other supplement reseller, it is possible to recieve our BioResponse DIM products at a wholesale price for resale purposes. If you fit this wholesale criteria, fill out the form here to request a wholesale group account. We will contact you, and let you know if you qualify. Once your account is added to our wholesale group, you will just need to Log In at the beginning of your order to purchase our products at the wholesale price. To order BioResponse products, go to our Products Menu. Click on a product image for more information or select the Add To Cart link to add 1 unit to your Shopping Cart. If you want to order more than a single unit of an item, you can add multiple units on the product detail page Add To Cart form, or simply update the quantity for the item in the Shopping Cart. Once you click an Add To Cart link (or button on the product details page), you will be redirected to our Shopping Cart that displays a summary of your order. If you have a special offer discount code, enter it into the text field below the Shopping Cart and click the Submit Discount Code button. Otherwise, click the Proceed To Checkout button. If you have ordered on our site before, you can simply log in to proceed with checkout. Otherwise, new customers click the Create My BioResponse.com Account button. Once you create your account, you will be directed to the Order Details page that will display the details of your order. Typically pricing for the most cost effective shipping method for your order will be displayed. Click the Change Shipping Method link if you want to add an expedited shipping option for your order. If you would like to include any comments with your order, enter them into the Special Instructions text field. If everything is correct, click the Submit Order & Proceed To Payment button. On the following payment screen you will submit your secure Visa, MasterCard, or Discover credit card account payment. Your payment will be authorized immediately and you will be directed to the Order Confirmation page where you can print your receipt. Details for all of your online orders are available in the My Account area. Log in anytime 24/7 to check the status of your orders. >> Is there a bulk order discount? Yes. We offer discounts based on the total price of your shopping basket, before shipping or tax. We offer a 5% discount at $100, and a 10% discount at a $200 purchase. To pay for your order, we accept Visa, Mastercard, Discover, and American Express. >> Where can I purchase Phytosorb-DIM? Phytosorb DIM® is identical to BioResponse DIM® in its ingredients. If you are looking for Phytosorb DIM®, please contact us. We would be happy to help you. >> How do I change the type or quantity of my order? >> How do I track the status of my order? To track the status of orders placed online at BioResponse.com, please first Log In to your account. Your online order history will be displayed. Please contact us if you have any questions regarding your order. BioResponse Nutrients is so confident in the quality and effectiveness of our products that we offer a Money-Back Guarantee on our products. If for some reason you are not satisfied with our products, please contact us within thirty (30) days of the purchase date for a full refund. >> Is the BioResponse.com Store secure? >> Is my personal information safe? We use web server usage statistics (such as number of visitors, browsers used, etc.) to help administer and refine our site. This data is not linked to any personally identifiable information. Diindolylmethane, or DIM for short, is a plant indole—a plant compound with health-promoting properties. DIM is found in cruciferous vegetables, including cabbage, broccoli, Brussels sprouts, and cauliflower. DIM promotes beneficial, healthy estrogen metabolism in both women and men. This estrogen metabolism is more favorable because it increases conversion of estrogen to 2-hydroxy and 2-methoxy metabolites. DIM is not a plant estrogen or an estrogen mimic, like the soy isoflavones, but rather an estrogen balancer. Prominent researchers have documented that the balance of estrogen metabolites is an important factor in maintaining breast and prostate health. Women and men also use BioResponse DIM® as an integral part of successful weight management programs. >> How does DIM help promote hormonal balance? DIM stimulates more efficient metabolism for estrogen. Supplementing the diet with DIM and eating cruciferous vegetables increases the specific aerobic metabolism for estrogen, multiplying the chance for estrogen to be broken down into its beneficial or “good” estrogen metabolites. Many of the benefits that are attributed to estrogen, including its ability to protect the heart and brain with its antioxidant activity, are now known to come from these “good” metabolites. >> What is BioResponse DIM? To be beneficial, pure DIM needs to be absorbable. Pure DIM is crystalline, highly insoluble, and very poorly absorbed. 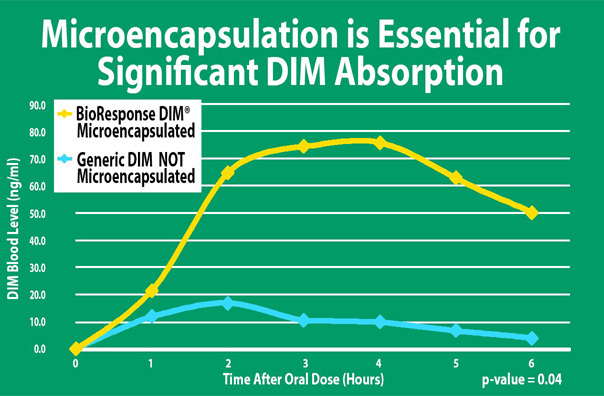 The absorption hurdle for DIM was cleared when BioResponse Nutrients developed its unique and patented microencapsulated delivery system – the only method known to produce truly absorbable DIM. 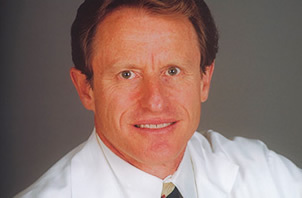 BioResponse DIM is the only form of DIM used in clinical trials sponsored by the National Cancer Institute. 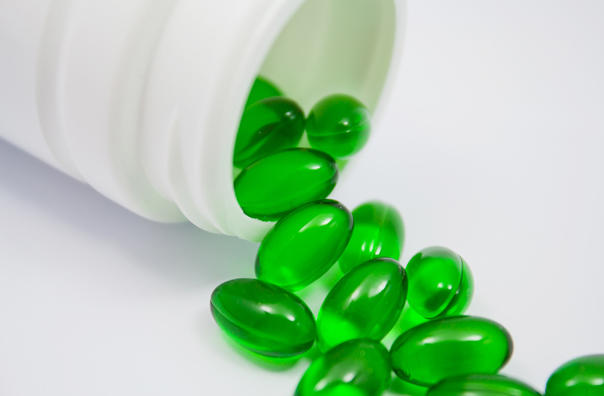 >> Why is microencapsulation important? >> What is Phytosorb DIM®? Phytosorb DIM® is identical to BioResponse DIM in its ingredients. Our Phytosorb label has been discontinued. Individuals who have purchased Phytosorb DIM products in the past should now purchase our BioResponse DIM products. To find out more information, please call us at 877-312-5777. >> What is the difference between BioResponse DIM® 150 and BioResponse DIM® 75? BioResponse DIM® 150 contains 150 mg of BioResponse DIM per capsule, whereas BioResponse DIM® 75 contains 75 mg of BioResponse DIM per capsule. >> What about Indole-3-carbinol (I3C)? Besides Diindolylmethane (DIM), its natural precursor, Indole-3-carbinol (I3C) is also present in cruciferous vegetables. I3C was the cruciferous indole first sold as a dietary supplement. Though still marketed by other companies as a dietary supplement, it turns out that I3C is not active in your body until it is converted into DIM. Both DIM and I3C show real promise, yet studies have also uncovered sharp contrasts between them in one critical area — consumer safety. I3C is highly unstable and can transform into many other substances whose actions are undesirable. Anyone advocating the benefits of I3C over DIM is ignoring the published scientific facts. These facts are presented in a recent independent review on I3C. For these reasons, I3C’s use as a dietary supplement is not recommended. An earlier review specifically addresses the safety concerns relating to I3C. >> Do you offer free shipping? Free First Class Mail shipping is available for all domestic retail customers on orders of 2 or more bottles. >> What shipping methods are available? We offer a variety of shipping options which you can choose during the checkout process, including Standard USPS First Class Mail, USPS Priority Mail, UPS, and FedEx. Please note that the size and weight of your order will affect which shipping options are available. Orders over 1 lb cannot be shipped via USPS and must be shipped via either UPS or FedEx. Also, certain shipping options do not ship to residences. If you accidentally pick a shipping option that is not available for your specific address, we will contact you with other shipping options. >> What are the delivery times for the shipping methods? United States Postal Service (USPS)- The USPS has the following estimates for their shipping methods. Please note that these shipping speeds are only estimates and are NOT guaranteed. Please choose a UPS or FedEx shipping method if you need your order to arrive by a guaranteed date. *Shipping speeds for USPS are NOT guaranteed. >> When will my order be shipped? Your order will generally be processed and shipped within 1 business day. >> How much will shipping cost? We strive to provide you with a variety of cost-effective shipping methods. The shipping charge for your order is equal to what the shipping method you choose costs us, without any added handling charges or fees. Sometimes the actual shipping cost varies from what was estimated on our website. An additional residential surcharge may apply to UPS and FedEx shipments. We pass any additional shipping savings that we receive directly onto you. >> Do you offer shipping tracking? We would be happy to provide you with the tracking number for your order when shipped via UPS or FedEx. Please contact us if you would like to receive the tracking number for your order. USPS. shipments do not have tracking numbers. If you have a question about your order, please contact us and we would be happy to help you. >> Do you offer shipping insurance? Insurance for your order is included with UPS and FedEx shipments. For international orders, insurance is included with Express Mail International shipments. Insurance is not currently available for domestic United States Postal Service methods. We recommend one of the UPS or FedEx shipping options if you would like your order to be insured. >> Do you ship outside of the U.S.? Yes. For international orders, we offer First Class Mail International, Priority Mail International, and Express Mail International services through the United States Postal Service. International shipping options available vary with each country. You will see the shipping methods available for your country during the checkout process. Some countries may charge import taxes, customs fees, or duties on imported items. Any import duties or fees are determined by the receiving country and are the responsibility of the recipient.